Surprise, surprise: The Pixelbook will get the feature first. Chromebooks have always generally been cheap and accessible, but now they're about to get a lot more capable. Google announced today that Chromebooks will soon be able to run native Linux apps in addition to the Chrome web apps and Android apps that they already support. Not surprisingly, Google's own premium Pixelbook will be the first to get Linux app support, though we're told other models will join in before long. If you've been paying attention to very specific corners of the internet, this news might not be very new: word of the feature has been floating around for weeks, and it officially appeared in Canary channel Chrome OS builds the week before I/O. While this is the first time Google has officially embraced Linux for Chromebooks, enthusiasts have had their own unsanctioned options for a while now -- a project called Crouton allowed users to create an isolated file system where they could install Linux distros like Ubuntu. The problem was, Crouton required users to enable developer mode and disable some of Chrome OS's key security measures as a result. Google's approach is a little different: Rather than install Linux into a separate sandbox of its own, Google built a custom virtual machine (VM), inside of which runs a version of Debian. That way, the people actually using the Chromebook don't miss out on those security features and get to play with a version of Linux that can directly integrate into the Chrome OS desktop. Google says Linux apps can be launched straight from the Launcher and can tap into files saved in your Downloads folder. Of course, since we're talking about a virtual machine here, performance limitations aren't out of the question. 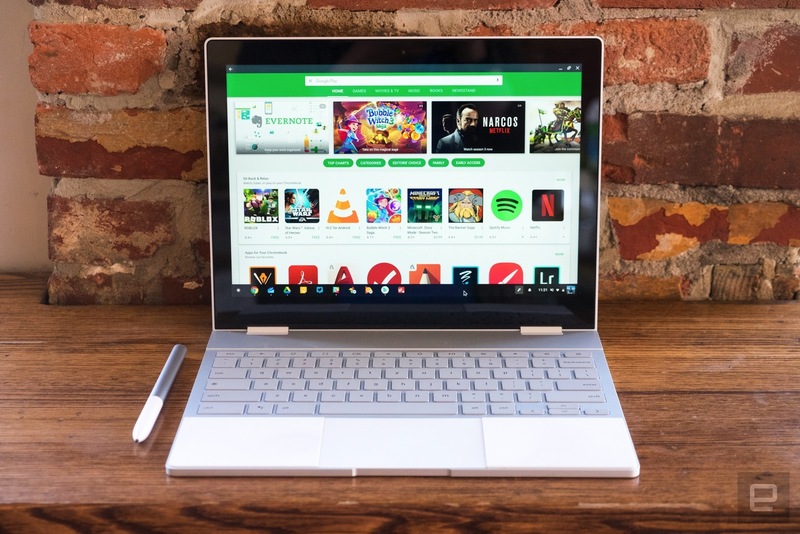 Google is confident that running most Linux apps within Chrome OS shouldn't pose too many issues, but Kan Liu, director of product management for Chrome OS, concedes that running elaborate apps like the GIMP, for image editing, may slow down some less powerful Chromebooks. No wonder the Pixelbook is the first model to officially get Linux app support. Even better for Google, the move may further solidify Chrome OS as a powerful option for use in schools, particularly in computer science curricula. With Linux running in a virtual machine on a Chromebook, novice app builders could install, say, Android Studio, put some code together, compile it and run it on the same machine. That's a feat that's simply not possible if you're working with iOS -- the best you can do within Apple's ecosystem is to whip up an app and run it on an Xcode simulator. The newfound seamlessness in Android app development is a distinct plus, but that's obviously not the only path available to developers and students -- Linux's flexibility means they'll be able to craft code on Chromebooks in ways that just weren't possible before.